My last post was October 17th, and I usually don't wait so long to write, but my abnormal life has been more abnormal than usual of late. I did enjoy the most wonderful weekend with two of my closest friends back in October. 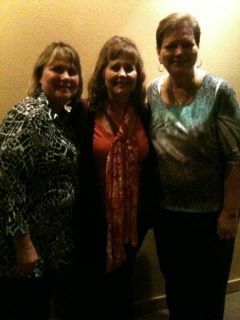 I've known Kathy and Rhonda since our youngest kids were about 2. We all turned 50 within a few months of each other, and we had planned for a few years to do something special that year. That was the year we lost our son, Andrew, and so many things happened. Two years ago, we had it planned, I had my plane ticket, and then Billy got much worse, and I got sick. Rhonda and Kathy went without me, and I grieved for a while! I had decided that I couldn't be stopped this time, and thankfully, God worked things out for me to go. Shelley spent one night with her dad and got him on the bus to the Cottage the next morning. Billy spent the weekend with his sister, Cindy, and I believe it was good for both of them. He did very well with her, and I was so relieved and grateful. Rhonda and her husband, Rick, have a beautiful home in the mountains of Ruidoso, NM, where we stayed. To say it was fabulous would be an understatement. The weather was perfect, the scenery was gorgeous, and my stress level was zero! It was lovely, and I can hardly wait for another trip with these gals. After many tests, my mom has been diagnosed with cancer of unknown origin, and after a group of various specialists met to discuss her tumors, the decision was made that surgery on the tumors is too risky. She starts with chemo this next Wednesday, and her oncologist feels the tumors can be taken care of with chemo...not sure how many rounds, but they will begin with four rounds and then do another scan. Our only real reference point for chemo treatment was my brother who was on chemo for the two and a half years he lived after diagnosis of stage four colon cancer. It made him very ill at times; he dealt with neuropathy, cold sensitivity, and severe nausea at times. I don't believe Mom's chemo will be as rough, but it's still unknown. Getting Mom well is our priority, while we also try to do what is best for my dad, but he is more than resistant. Dad's health has declined tremendously in the last 14 months, and a large part of that decline is cognitive. Since I've had some experience with cognitive issues in the last few years, I recognize some needs, but my mom has more than she can handle right now. Please keep us all in your prayers as we sort through and prioritize what needs to be done. For now, I've put my emotions on hold because I have too many decisions to make. Shelley and I attended an awesome conference on caregiving last Friday. The speaker/teacher was Teepa Snow who is by trade an occupational therapist and has 30 years of experience working with dementia patients. We hung on every word she said, and she gave great suggestions on handling so many situations. The social worker and main caretaker from the Cottage were at the seminar, and at different times during breaks in the day, they came by to tell me they kept thinking of Billy in so many of the scenarios Teepa gave. The challenge for me is to implement the techniques and make them automatic. Today was a particularly difficult day. My sister and I had gone to my parents' yesterday to present some possible scenarios to my dad mostly, and it was a little stressful. I wanted to do nothing today but stay home and try to catch up on some household chores. Billy wakes up every morning wondering where we are going and what we'll be doing. Even though I may tell him that we are staying home, it doesn't process. After a few hours of the questions, we did go get a drink at McDonald's, and then we dropped by my sister's house. I was hoping he might be somewhat content to watch the Cowboys game with my brother-in-law, and I went outside with my sister to push my niece and nephew on their swings. Billy couldn't attend to the game...he came outside about 3 or 4 times to "see what I was doing." He sticks like glue, and at one point during the day, I told him I had to go to the restroom. In less than five minutes, I heard the front door open (not a good sound when he's alone), and a moment later, he was back in the house calling for me in a distressed tone. I yelled that I was in the restroom and would be right there. He cannot remember from one moment to the next what I say. With the pretty weather today, and knowing that bulk trash pickup is tomorrow morning, I had a strong desire to go through some boxes in the garage. That was futile because my shadow accompanied me, and I got more frustrated. I had asked Billy to allow me to work in the garage alone, but he doesn't understand that. At one point, I snapped at him, and the look in his eyes made me ashamed of myself. I realized that the garage can wait, and Billy needs me to be with him...even if it's just to sit and do nothing. Pray for me to be better at meeting Billy's needs and use the techniques I've learned. Please keep my parents in your prayers as we work toward positive solutions for all the issues we are presented. Thank you to all who read my blog...your prayers sustain me, and your thoughts and comments keep me sane. Praying for you, Kathy! Crying out to Abba for HIS strength, grace, wisdom, peace, comfort, healing, presence, & joy to be yours & your loved ones' today! Thank you for writing this blog.